Diwali is considered to be the biggest festival of India. When it comes to celebrating this grand festival, sending gifts to close people your family members, friends, and loved ones is like a ritual of this festival. If you are looking for Diwali gifts price between 300 to 600, buying it from the online store of FlowerAura could be the best option for you. Diwali is the most awaited festival of the year that we Indians look forward to celebrating it with utmost zeal and enthusiasm. Although it’s a Hindu festival, you can find people from different other religions grooving to the sounds of crackers during Diwali. 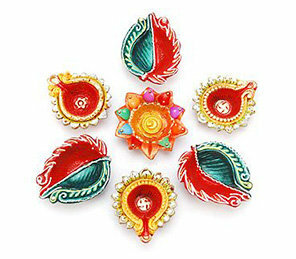 On the occasion of Diwali, people decorate their houses with Diyas, candles, and sparkling lights. Also, known as the festival of lights, Diwali signifies the triumph of good over evil and light over darkness. So, since the auspicious festival of Deepavali is just around the corner, you must have already begun your Diwali shopping. But, have you the yet found the best Diwali gifts for your loved ones at an affordable price? If not, then don’t worry because FlowerAura is here with its exclusive collection of Diwali gifts between 300-600 that are meaningful and trendy at the same time. Whether you are looking for personalized gifts or Diwali handmade gifts, you can find everything on our online gift portal. To add stars to your Diwali celebrations, we are here with a wide range of unique Diwali gifts that will help you convey your emotions for your loved ones in the most beautiful manner. From mugs to cushions, decorative Diyas to scented candles, pooja accessories to delicious sweets, Diwali chocolates to dry fruits, we provide a wide assortment of handpicked gifts to choose from. So, if you want to buy a gift for Diwali between 300 to 600 online, rely on us for a hassle-free online delivery service. Our meaningful range of Diwali gifts is sure to enlighten your loved one’s lives and put a smile on their face. So, this festive season, you don’t have to step out to buy the best gifts for your loved ones as you can now sit at your home and place your order online from us. The celebration of Diwali can’t be complete without sending your warm wishes to your loved ones. Right? But, if your loved ones live away miles apart from you, it becomes impossible for you to reach out to each and every one on the occasion of Diwali. Although you can wish them on calls, that wouldn’t be enough. So, to strengthen your bond with them, send Diwali gifts between 300-600 for them via our express delivery services. You can send delicious Diwali chocolates for your loved ones and sweeten up your bond with them. To provide our customers with 100% customer satisfaction, we ensure same day delivery and midnight delivery of Diwali gifts in more than 200+ cities of India. With the aid of our hassle-free delivery services, you can send flowers for Diwali or sweets or any gift item for your loved ones without any reluctance. If you have placed an order of a gift with us which you can’t receive today then, you can avail our next-day delivery services for that. Also, along with our impeccable delivery services, we provide free shipping benefit to our customers. This is how we strive to make your online shopping experience a happy one with us. So, have a happy and safe Diwali with your loved ones!